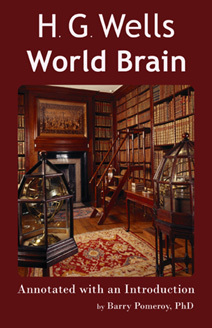 This annotated edition of World Brain is meant to stimulate scholars to return to this giant intellect, a writer who, with only microfiche to inspire his understanding of the possibilities of communications technology, imagined a connected and coordinated world sharing a huge knowledge base. Wells was inspired by the needs of a world teetering on the brink of global war, and eagerly met with Stalin and Roosevelt to learn what they knew of the peace process. When he found them without advisors, he turned to the education system only to be dismayed by its derivative and dismal state. Finally, Wells decided that the ordinary citizen would have to teach themselves, and he turned his considerable mind to the task of how that might be effected. He imagined a globally financed encyclopedia, which would be continually updated by teams of volunteers and would serve the intellectual needs of the modern citizen. In these days of internet technology, H. G. Wells' warnings and imaginings are more relevant than ever, as in these fever days of incipient nanotechnology, ghostly quantum effects, and international media system threats of global conflict, we are increasingly drowning in a sea of information we can scarcely understand. Wells' synthesis of information delivery systems, and the competent receiver and producer he imagines at its centre, has much to offer the modern scholar who is trying to make the cornucopia of the internet relevant to our changing world.